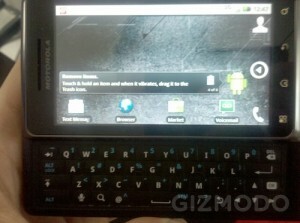 One of Gizmodo’s lucky readers was able to get his hands on the upcoming Droid 2 from Verizon and Motorola. Since we pretty much know all there is in terms of specs (1GHz, 5- megapixel camera, 8GB of internal storage) we’ll jump right to his perception of the phone. I think it’s worth pointing out that this was not a “professional” hands-on nor did he expect to see the phone. This was simply a lucky Droid owner treated to an early look at its predecessor. In terms of form factor, it’s almost identical to the Droid except smoother, with “a lot more curves and less sharp edges” than the original. Even though it has the same resolution as the first edition, the camera seemed “definitely faster”. The wider keyboard made for easier typing and he was a big fan of the directional buttons over the d-pad. The user interface looked to be the same (ShadowBlur) that’s been in the leaked pictures. When he asked the Verizon rep about the OS he was told that the phone would likely have stock Froyo on it instead of the custom skin. If not Froyo, it would be Donut (2.1) with an update following close behind. Click here to read the full email as it was passed along to Gizmodo.